We weren’t able to raise enough funding to take Hamlet to the level we wanted to (for those interested, we raised less than 1/4 of our first pillar, and our recent land auction endeavors didn’t quite break L$20,000), and thus it’s time for us to move on and continue with what we can. Next up, we have something new and something old — Twelfth Night for 2009, quite a bit of editing to be done on the web, too. Expect to see more on the site soon! This Hamlet blog is now obsolete! Please visit the above! RESCHEDULED AND ALL LAND PARCELS REDUCED TO L$1 starting bid. COME! the large parcel will not be auctioned off as a whole. But, for those who cannot make it, a silent auction will be in session. Visit the parcel you’re interested in and find the pillar owned by your favorite SLSC-spectator avatar “Ticket Stand.” All donations are accepted and noted, but bid your highest bid to win! *Seth 7 also comes with two free Adobe houses created by Azure Island builders! We didn’t quite make our first pillar in our 14-Pillars fundraiser. Nope, though at the time we started it there were 14 million registered accounts on SL, we haven’t yet seen every single one of them drop by and donate just L$1 to fill these 14 pillars, a million per pillar. We only raised about 0.25 of our first pillar. Now that we’ve had our fun with art in our last production, we must return to the nitty gritty fundraising again. So, here’s Pillar #1 Reloaded. You are formally invited to take photos of the SL Shakespeare Company’s opening production in our Fall 2008 season… and add them to this flickr group… to win! Photos we like the best will win prizes from the production, such as the Stratocaster seen in a poster in the set or the theatrical skins or components from actor outfits you’ll see on stage in the next two weeks. The design takes into account how in a 3d world, the audience can zoom/pan around “backstage”… so we want to leave the real backstage as an area they shouldn’t be panning into, which brings the corridor outside Bill’s apartment to the set, which they can freely pan into for the traditional offstage parts, such as when future-Lucy yells from traditional offstage. The custom features of the set continues with innovative on-stage advertising. 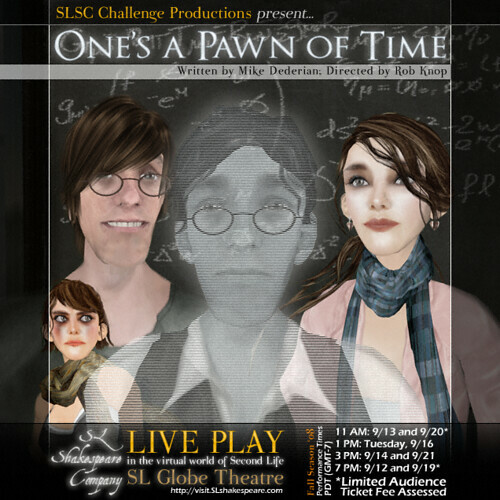 As this is the first non-Shakespearean play produced by the SLSC, it has provided them a unique opportunity to experiment with interactive and dynamic advertising. Centaur also says, “The set is filled with details and interactive ‘incognito’ advertisements blended into the stage in the form of fake movie and rock band posters, newspapers, books, photos, and magazines, to amuse and inform those who zoom around and explore as only a virtual audience might.” To arrange in-set advertising, contact Ina Centaur directly. Kinji Lockjaw, who also plays Lucy, is happy to admit that the biggest challenge for her is the fact that it’s her first SL play. She remains positive though, and states, “I’m very excited about […] getting to work under the direction of Prospero and working with such great actors,” a sentiment expressed by the other three actors, as well. The fast-paced dialogue in the play ensures that the actors have achieved a good rapport with each other and will be able to generate energy on the SL stage, a crucial aspect of the real world stage, too. For more information on this and future productions, join the SL Shakespeare Company group in-world. One’s A Pawn of Time - Opens this Friday! potentially feature your brand deserve no less. that also serves as a magazine dispenser. poster on a side wall. landmark is provided free of charge on all offers. and fan machinima video's per the terms dispensed at the production. as the SL Globe Theatre and Shakespeare island sim. notice of the next performance date! Want more? Flip through our past programs, see our wardrobe from past productions, or ask Ina Centaur for a press pack inworld. Come to the audition ready to read a short monologue from a modern play. You will also do cold readings of the play that we’re planning to perform. The show has three parts, two men (Will and Bill) and one woman (Lucy). The plan is to cast a primary and an understudy for each part, although each understudy will be scheduled ahead of time to perform in at least one or two performances. To add diversity to our season, SLSC Challenge Productions feature modern and non-Shakespearen works as brought to our attention by inhouse members and audience and fans.